Good roommates can change your life for the better, while bad roommates tear your life to pieces. 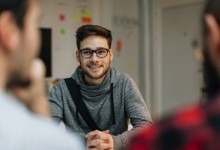 Unless you’re cohabitating with a significant other or lucky enough to have your own space, you probably need a roommate to afford to live in New York City. You are probably also keenly aware that a bad roommate can tear your life to pieces. A good roommate, on the other hand, can change your life for the better—providing a live-in friend with whom to share meals and throw parties. To boost the odds of making a match you can live with, there's plenty of due diligence you can do—like posing these 20 questions to prospective roomies, looking for telltale signs of potentially problematic roommates, and keeping your radar up for roommate scams. You can also leverage a slew of online roommate finders—some old, some new—to help you surface like-minded candidates for cohabitation. 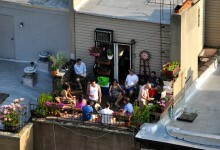 Some sites are for everyone, while others are more niche, connecting potential apartment sharers who are exclusively in the performing arts or those in the LGBTQ or Jewish communities. 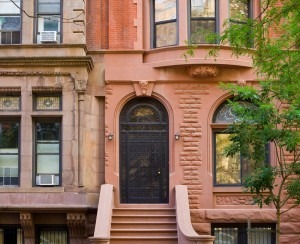 Below, our guide to the websites most suited for finding a roommate in New York City. Need help finding a rental that allows temporary walls—or a landlord who will accept multiple guarantors? The rental experts at Triplemint, a Brick Underground partner, know exactly where to look. If you sign up here, you can also take advantage of Triplemint's corporate relocation rate—where you'll pay a broker's fee of 10 percent of a year's rent instead of the usual 12 to 15 percent on open listings. Bonus: The agents at Triplemint are a delight to deal with. 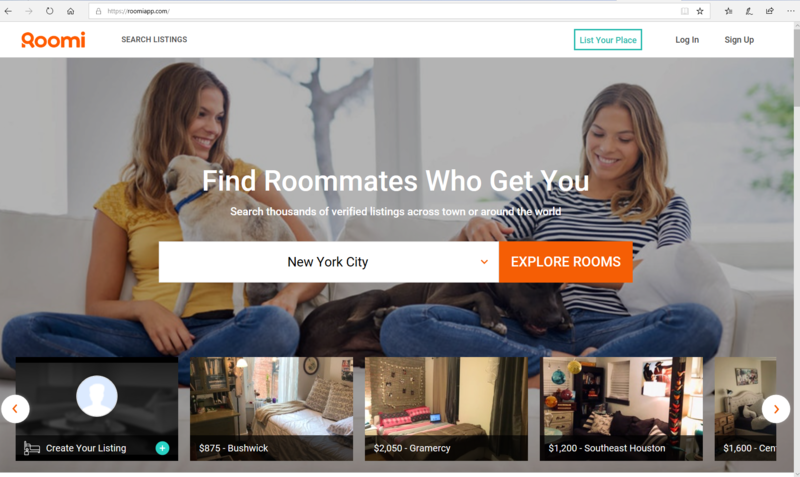 Roomi, whose ads currently dominate your subway commute, allows users to check out profiles of prospective new, well, roomies, which include photos of not just the apartment, but the roommates themselves. 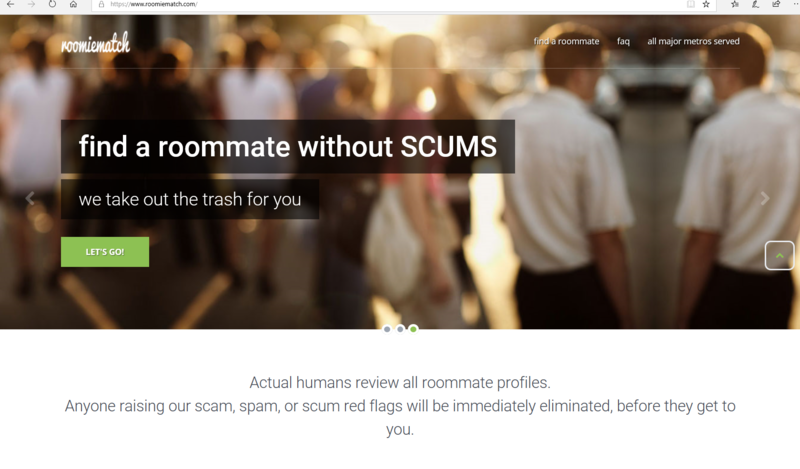 The site includes a section for work history and a short bio, as well as preferences for what each person wants to see in a roommate, like whether it’s okay to smoke or bring pets. If it feels a little like online dating, it’s because finding a roommate frankly isn’t far off. 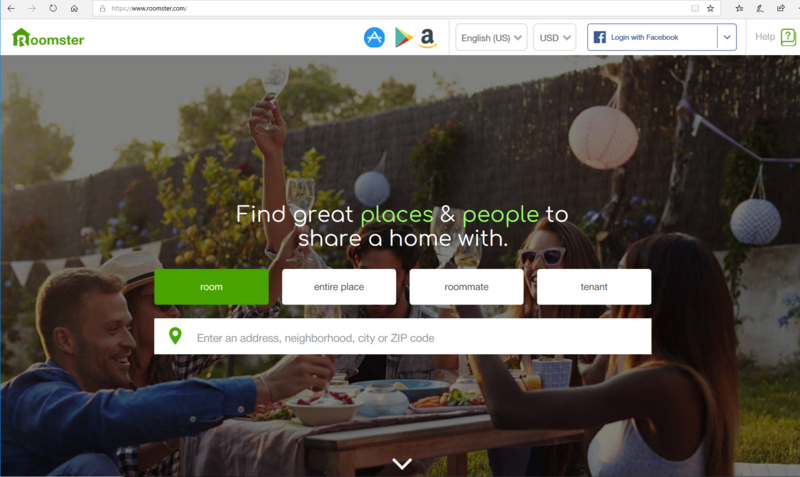 In fact, the company announced earlier this year that it had acquired Symbi, which had a similar compatibility-focused ethos described by its founders as "Match.com for the roommate world." Diggz requires you to sign in using either Facebook or your email address, and then asks you to create a profile. Here, you fill in not only your apartment preferences, like lease duration and budget, but also details about your habits in terms of sleeping hours, social life, and relationship with substances like alcohol, drugs, and tobacco. Once you’ve done that, Diggz uses an algorithm to show you 10 potential roommate matches, enabling you to “like” those with whom you feel you’d get along. Like Craigslist, Reddit is a free-for-all that requires a healthy degree of skepticism and stellar judgment skills to navigate successfully. 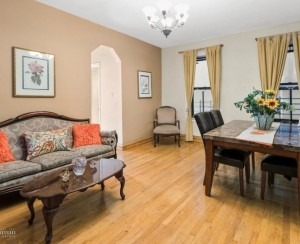 That said, if you’re willing to do some wading, reddit.com/r/NYCapartments is packed with listings. 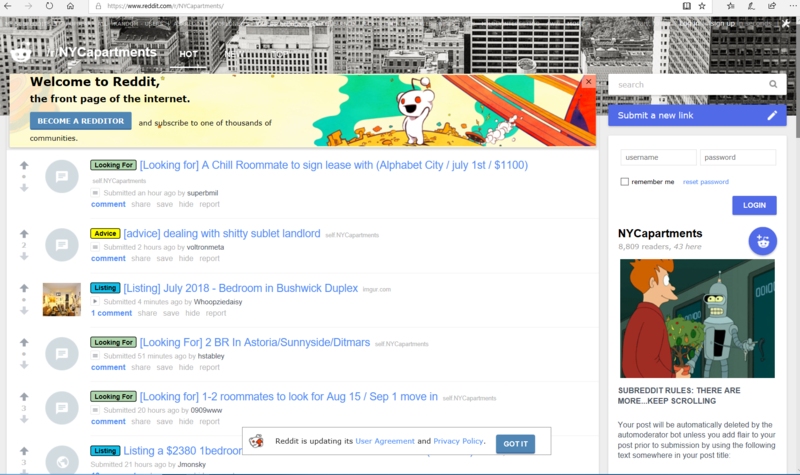 Bonus: In true reddit form, the site also has endless threads about common apartment-related queries, like how to get rid of cockroaches and whether in-building laundry is worth the extra cost. Rainbow Roommates caters to the LGBTQ community. 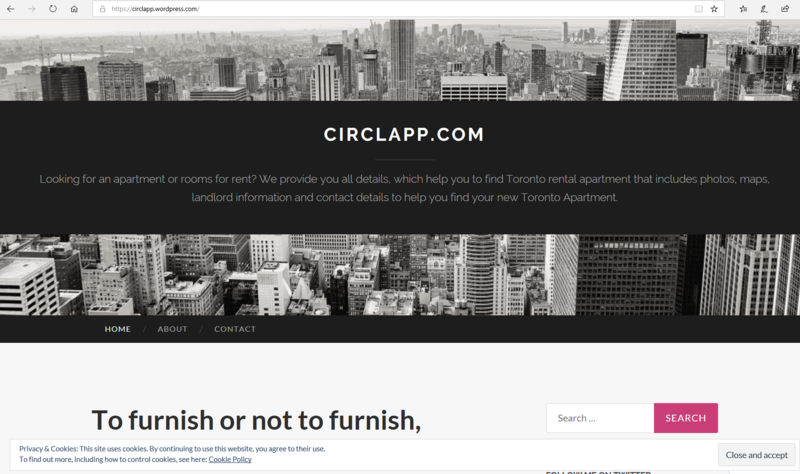 While it’s free to list an apartment, those on the hunt must sign up for a subscription, which ranges in price from $45 for a 15-day account to $140 for 90 days. 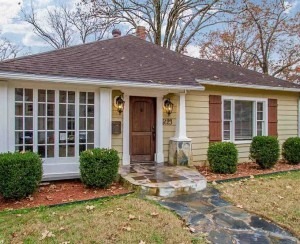 If that seems steep, the site does claim to help most clients find a new home within two weeks, making it a particularly good option for those on a tight deadline. 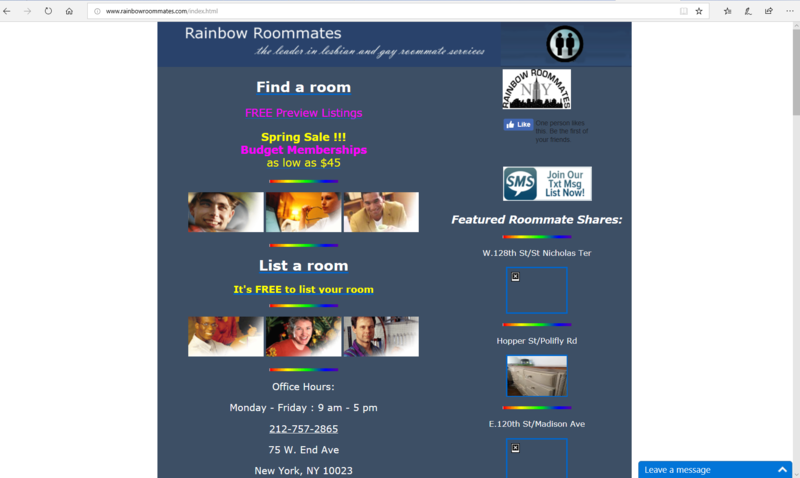 Furthermore, if you find a roommate through the site but decide within two months that it’s not working out, Rainbow Roommates offers the use of its service for a month with no additional charge. Ask any New Yorker for their go-to resource on apartment-hunting, and Listings Project is sure to be among the first things they mention. 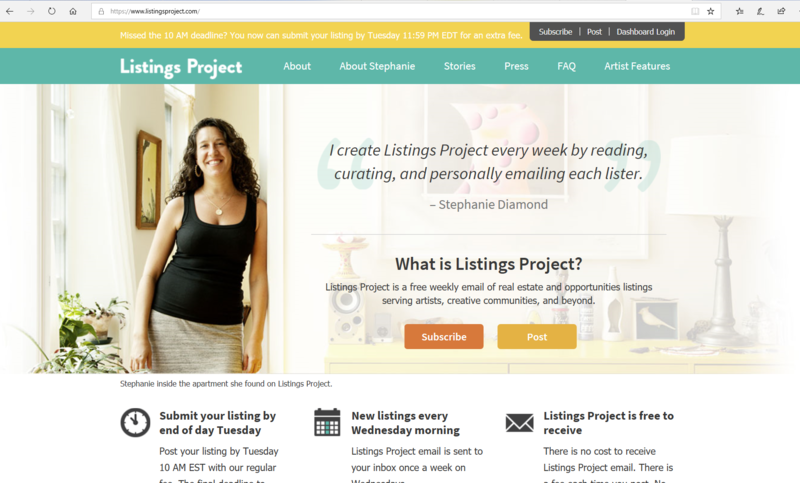 The list, initially launched as the personal project of Stephanie Diamond to help creative types find homes, has grown into a full-fledged operation that offers numerous fully vetted apartments for roommate seekers around the city. The list breaks down options into different categories, including sublet and long-term leases, and those looking to list an apartment must pay a $30 fee. Still, someone from Diamond’s team goes through each listing to weed out brokers and fakes, personally notifying posters if they’ve been approved. 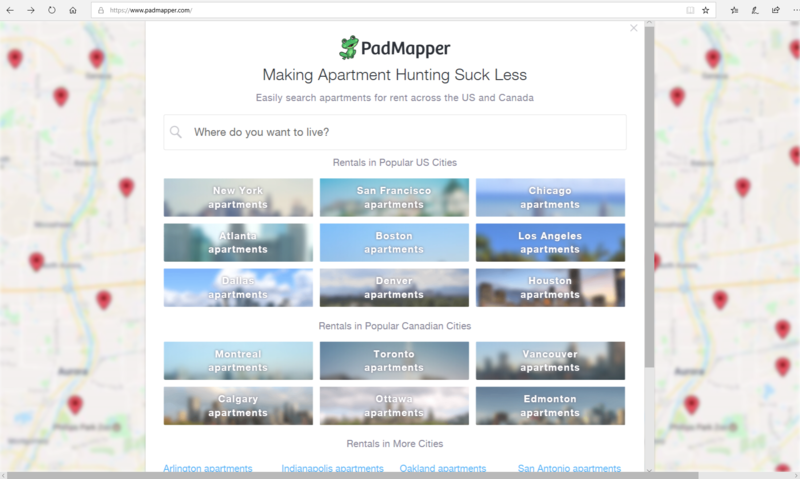 Padmapper isn’t specifically a roommate-search site, but that doesn’t mean it doesn’t function effectively as one. Select the “room” option to find a share, and trawl around the interactive map for places that fit your criteria, which is customizable with Padmapper’s many filters. 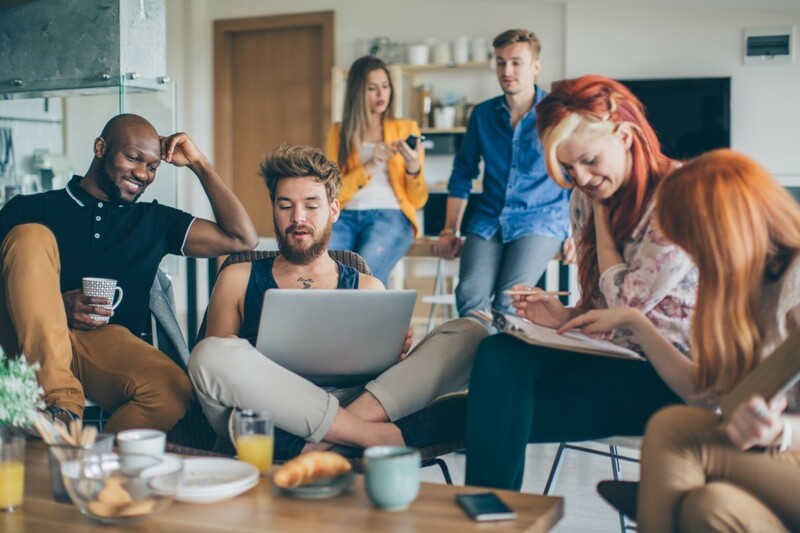 It may not offer the complete picture of your future roomies offered by other sites, but it does cull apartments from a number of different sources, including Airbnb, Apartment Search, and more than 100 others. It’s a good place to search if you’re less concerned about who you’re living with, but want a more complete picture of what’s out there. 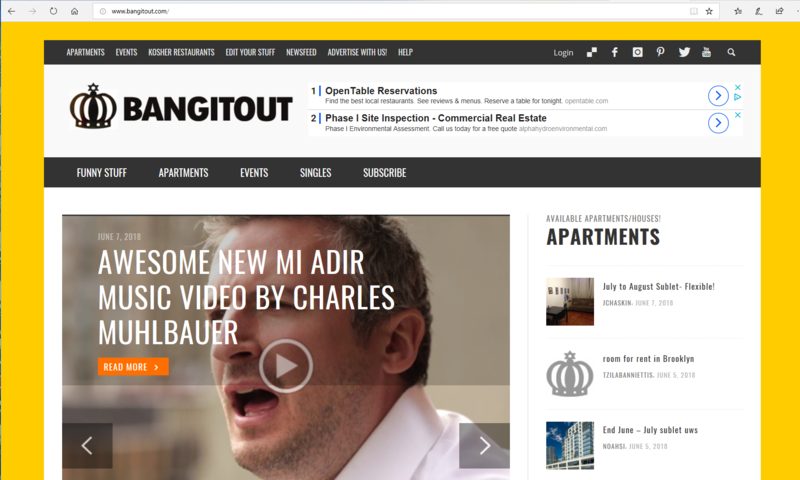 Questionable name aside, BangItOut serves a primarily Jewish population interested in keeping a kosher kitchen. The site is not real estate-specific, but it does offer a tab called “Apartments that Bang” featuring a modest number of listings concentrated largely on Manhattan’s Upper West Side. As of this writing, however, there are also a smattering of apartments throughout Brooklyn and Queens, and even a few in New Jersey. 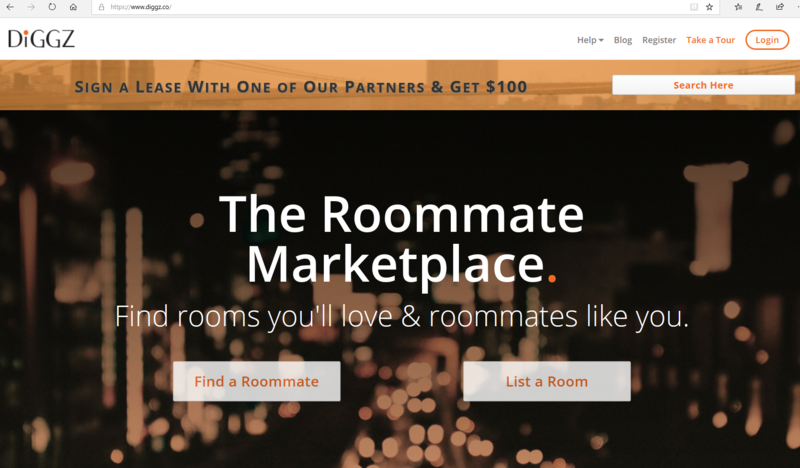 Roomster is an apartment-listing site that emphasizes roommates, which is apparent through its interactive map: Clicking on a listing will cause it to expand, and you’ll be directed to a profile that includes both information about the apartment, as well as basic biographical facts about who else is living there. The thoroughness of profiles varies wildly. The site allows users to personalize details like food preferences, sleep habits, and how often overnight guests are expected. Roomster, however, doesn’t stop there: Its Social Connect feature allows verified users to contact each other directly, though the catch is that responding to messages requires payment, ranging from around $6 for three messages to $30 for a month. RoomieMatch manages to take what tends to be the onerous process of apartment hunting and makes it, dare I say, sort of fun. It treats making your roommate profile as a sort of personality quiz, diving deep into your quirks (what’s your attitude toward recycling? Personal items in common areas?). RoomieMatch then emails matches directly to users, without the option of perusing options on your own. The catch is that the service is $20 per year to contact matches, which could be well worth it if you’re a perennial subletter and intend to move a few times. 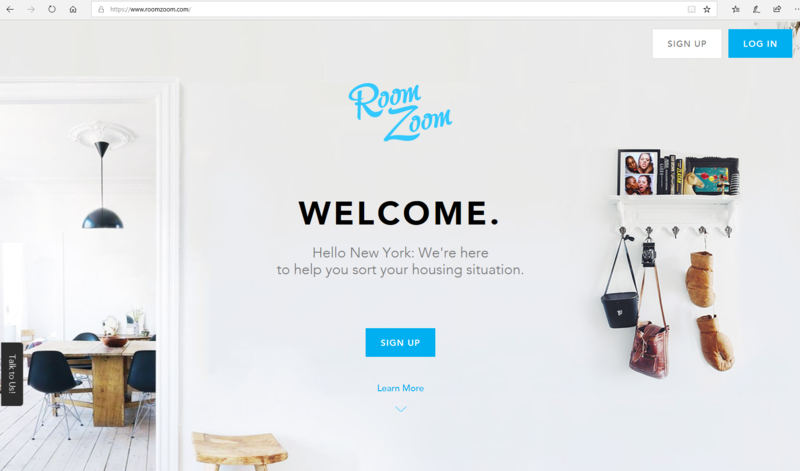 Room Zoom started the same way most good ideas start: Its founder, ElienBlue Becque, was sick of sifting through the dumping ground of Craigslist every time she needed to fill a room in her affordable Williamsburg apartment, which yielded hundreds of emails from people. Room Zoom asks you first to create an account, then fill out a questionnaire that addresses roommate expectations, like level of cleanliness and capacity for social gatherings. The company then creates matches based on the data, and sends them back in the form of a ranked list. Of course, AI hasn’t yet taken the place of good old-fashioned personal connection, so once you receive your matches, you can view in-depth profiles of your potential roommates, and message them if they seem like a good fit. Circle is an app for your phone, and more reminiscent of Tinder than any other on this list. Currently only available in New York and Los Angeles, Circle asks users to set up their profiles by selecting photos, writing a bio, and choosing tags that describe their personalities, like “introvert,” “hitched,” “after partier,” and others. Then, because this is 2018, you are shown one potential roommate at a time, clicking either the “C” on the right of their profiles if you’re interested, or the “X’ if you’re not. If two users show mutual interest, they are given the option to chat, and from there determine whether they want to live together. But perhaps the best feature of Circle is that it shows you friends and mutual friends, who almost always make more appealing roommates than total strangers. What’s great about Janelle’s List and GhostlightHousing—which are both private Facebook groups—is their implied sense of intimacy. This is because both groups require some steps to join: In the case of Janelle’s List, it’s a referral from an existing group member; with GhostlightHousing, members must be demonstrably part of the performing arts community. 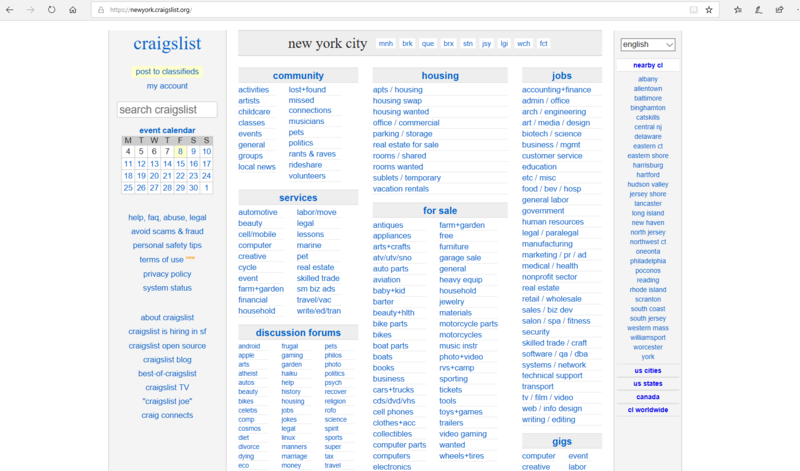 Once you’re in, though, you’re privy to a wide range of listings, many of which are cross-posted from Craigslist. Members of these groups, however, are generally given preferential treatment when it comes to responses, because even a tangential connection with someone forged through a private Facebook group is preferable to no connection at all.